Size of Baby: According to Baby Center, about the size of a leek…about 19 1/2 inches and around 6.8 pounds! Total Weight Gain/Loss: I think my scale at home is off…it always measures under. So we’ll say still up 26 pounds. Maternity Clothes: Actually haven’t been too bad this week…I had a few spring shirts just in case it got warm, and it has been, so I’ve been able to break out a couple of new things this week! Belly Button In/Out: Flat, occasionally an outie. She was kicking a few nights ago and actually kicked me right in the belly button, and I had a definite outie for a few minutes! Labor Signs: A whole lot of nothing this week. 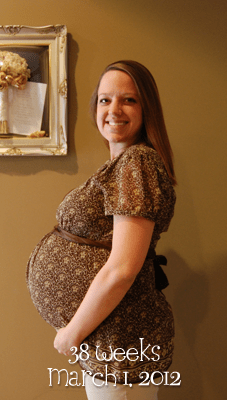 Braxton Hicks like normal, and maybe one or two real contractions, but definitely nothing big. Movement: She’s been doing a lot of the slinking across my belly this week. No big movements anymore, but I’ll occasionally see her move! Sleep: Is VERY difficult. I have to wake up every time I change positions now, so probably about once an hour. Add in bathroom trips during the night and it becomes very difficult to get a good night’s sleep. Still having to do Tylenol PM sometimes. What I miss: I can’t wait to function again! What I am looking forward to: We’ve decided we’re having a nothing day this weekend…it’s going to be a LONG time before we get another one, so we’re enjoying our time while we have it! Cravings/Aversions: Still just really thirsty all of the time…I’m wondering if I’m retaining a lot of it? Symptoms: Braxton Hicks, the occasional “real” contraction, swollen ankles, achy, especially in the morning and especially in my legs, insomnia. Best Moment This Week: Making it through yesterday without going into labor! 🙂 I really didn’t want to have her on February 29th…the leap year baby jokes have always gotten on my nerves. So I was very thankful she decided to keep on baking through that one (and that she’s still healthy and not coming early, of course)!